The Canada India Foundation hosted its second annual gala dinner in Toronto, Canada on April 18, 2009 following the CIF Energy Forum from April 15-17, 2009. The dinner honoured a highly accomplished individual as the recipient of the Canada India Foundation Chanchlani Global Indian Award. This award is presented annually to an outstanding Indian who has demonstrated global leadership, vision, and personal excellence, which has made all of us of Indian origin extremely proud of our heritage. 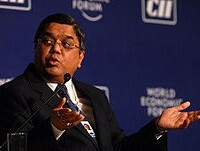 Tulsi Tanti is the chairman and managing director of Suzlon Energy, a Wind Power based company worth US $10 billion. He, along with his three siblings, own 70% of the company.He is from Gujarat where he started his first venture which was in textiles, then he moved into wind energy production and founded Suzlon Energy. He is worth $930 million as per Forbes. A commerce graduate and a diploma holder in mechanical engineering, Tulsi Tanti originally hails from Gujarat and is presently based in Pune, Maharashtra. Tulsi Tanti was earlier into textiles. He started his textile business in Gujarat. But he found the prospects stunted due to infrastructural bottlenecks. The biggest of them all was the cost and unavailability of power, which formed a high proportion of operating expenses of the textile industry. In 1990, Tulsi Tanti invested in two wind turbines and realized their huge potential. In 1995, he formed Suzlon and gradually quit textiles. Suzlon Energy is the fifth largest wind turbine manufacturer in the world and the largest in Asia. It is presently building what will be among the world’s largest wind parks of its kind at 1,000 MW capacity. Suzlon is on a global expansion drive. It recently acquired Hansen Transmissions, a Belgian maker of wind-turbine gearboxes. Suzlon is also building a rotor-blade factory in Minnesota and has invested $60 M in a factory in Tianjin, China.